Hand-crafted from real Himalayan Salt, our salt lamps come in several shapes and sizes. Shown is the Large Bowl of Spheres, made from real Himalayan pink salt. 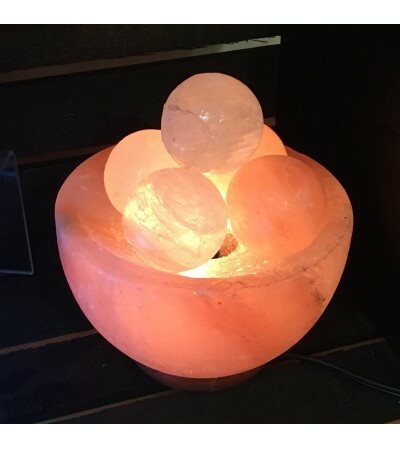 The salt lamp bowl is hand-shapened, mounted to a wooden base, and are heated by the included dimmable light bulb. Himalayan Salt Lamps are said to ionize & clean the air around them, boost your mood, and create a warm and relaxing ambiance.